Are you choosing to be brave? Every day you wake up you have a choice—to be brave or to be afraid. 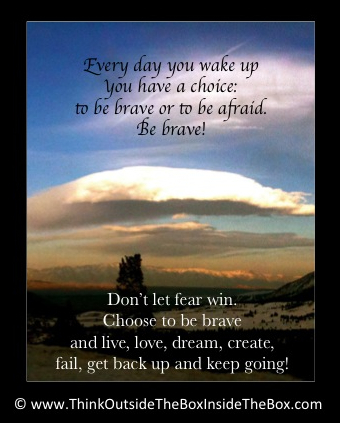 Are you choosing to be brave—to live, to love, to dream, to create, to fail, to get back up, to keep going? Or, are you letting fear win? Fear wins when you don’t believe in yourself. Fear wins when you don’t give your dreams a shot. Fear wins when you don’t take that chance on love. Fear wins when you decide to shelve that unconventional idea. Fear wins when you think you’re too old, too young, too uneducated, too ugly, too weird, or too late to make an effort toward creating something from what you have. Don’t let fear win! Make the choice to be brave every minute of every hour of every day you have on this earth and create from what you have—you have so much more than you realize! See it, appreciate it, and be brave enough to create from it.